This blog post first appeared earlier this week on Our Country Lives: the new MERL blog. 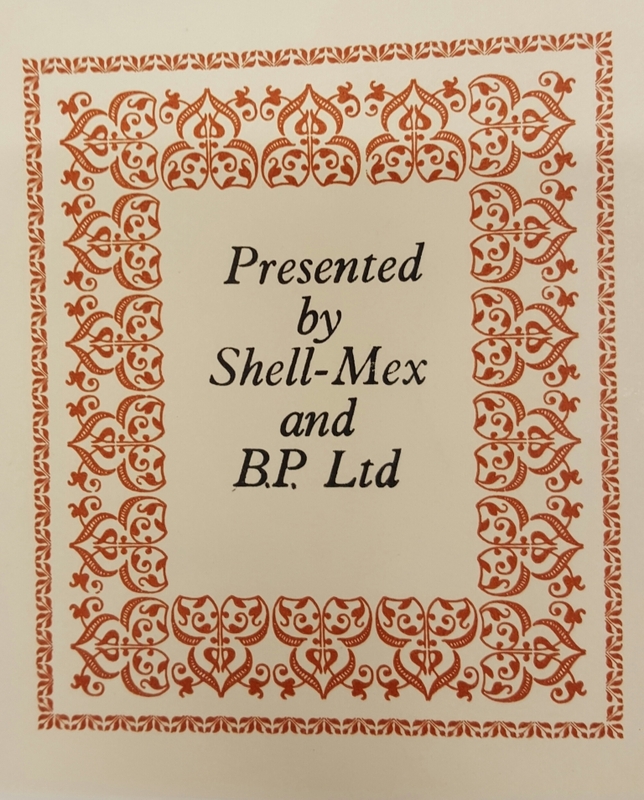 The Shell Guides we already hold mentioned below are part of our Printing Collection. Written by Claire Wooldridge, Project Senior Library Assistant: Landscape Institute. The Shell Guides, published between 1934 and 1984, were designed to be light hearted but engaging guide books to the countryside and historical sites of Great Britain for the growing number of mid twentieth century car owners. Published by the Architectural Press and funded by Shell-Mex (more driving = more fuel…) the Shell Guides were intended to tag along with day-trippers, being less than 50 pages long they were ideal for a glove compartment. Bold and visual, each guide contains an introduction to the area covered and descriptions of each place or landmark to be found there. 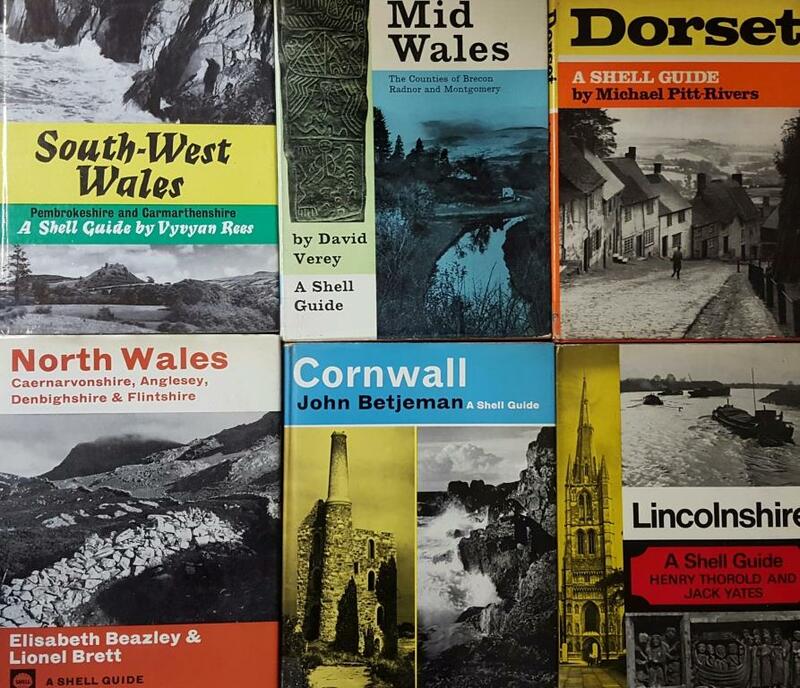 From Dorset to Derbyshire, Cambridgeshire to Cornwall, the guides covered most regions of Great Britain. Different regions were studied by different writers, including a host of well know names including John Piper (artist, 1903-1992, writer of Oxfordshire published in 1938) and Paul Nash (artist and painter, 1889-1947, writer of Dorset published in 1935). Paul Nash went to live in Swanage for a year to work on the book, suffering from shellshock from WW1, this was an opportunity for Nash to find peace in the countryside. Sir John Betjeman (poet, writer and broadcaster, 1906-1984) edited the series and also contributed several titles, most notably Cornwall (1934). We received several editions of the Shell Guides from the Landscape Institute library, some which were new to us and some which are different editions of titles we already hold. Several of these were presented by Shell-Mex and B. P. Ltd to the Landscape Institute. These new additions to the collection will sit alongside our existing ones in our Printing Collection (part of our Special Collections) with Landscape Institute provenance recorded in the catalogue records. The guides have an enduring popularity (such as being the focus of books and two TV series, one featuring Richard Wilson and another with David Heathcote, a cultural historian who has written about the Shell Guides) and are very collectable today. Thirteen Shell Guides were published before the outbreak of WW2 and were reissued after the war. Different editions within the Shell Guides series, with contemporary typography and images, were published in later decades – making collecting all the different copies something of a challenge! The Shell Guides from the Landscape Institute Collections make a wonderful addition to our existing holdings. For more information see David Heathcote’s (2010) A Shell eye on Britain: The Shell County Guides 1934-1984 (Libri). 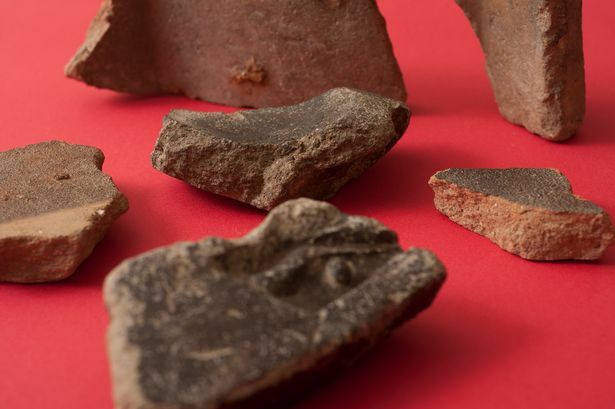 In 2011, the University of Reading received a remarkable and moving gift from the University of Hiroshima in Japan: a shattered roof tile collected from the riverbed near the hypocentre of the atomic bomb attack of 6 August 1945. The gift was made in recognition of the fact that the University had sent books in response to an appeal by its Japanese counterparts in 1951, as part of a project to establish an international peace library. 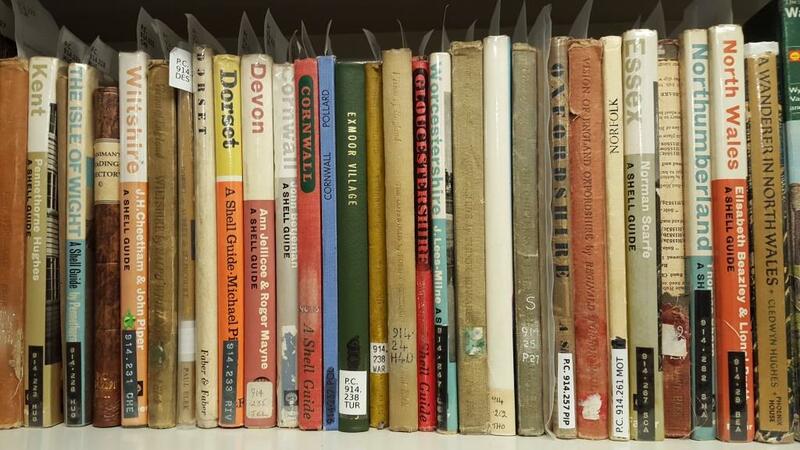 Recent research conducted by the University’s History Department has revealed that Reading was one of only a handful of universities in the UK, and the first, to respond. 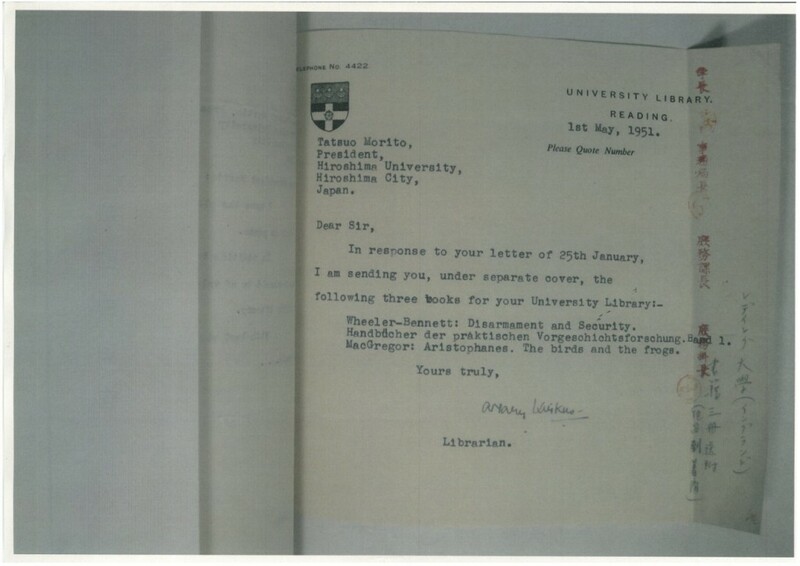 In 1951 HU President Tatsuo Morito sent letters to universities world-wide, asking for support to re-establish the university by donating books for a peace library, as well as seeds to bring the charred grounds back to life. 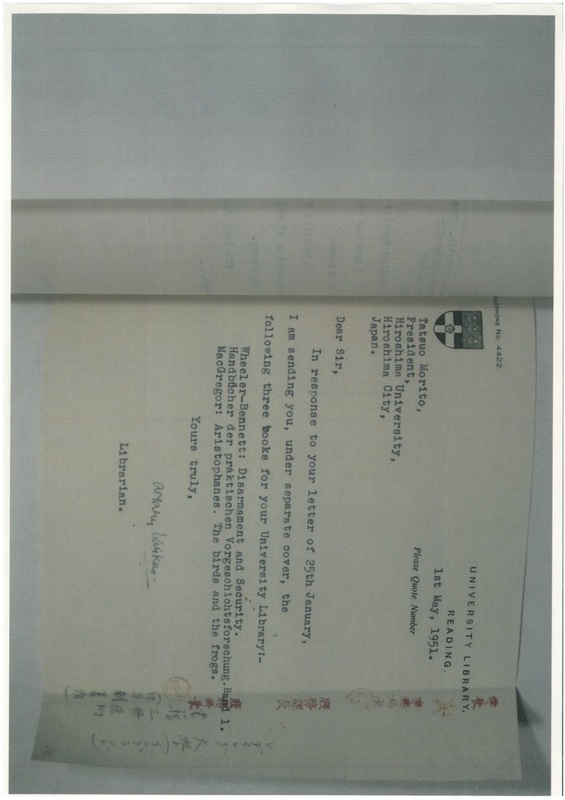 Documents from both universities’ archives reveal Reading was the first to respond, a decision that remained a secret for 60 years. Intriguingly, in the post war environment of economic gloom and emergent details of the war in the Far East, the research suggests that the decision may not have been sanctioned by senior management. Records show that is was not discussed, or at least minuted in any formal meeting, by senior figures at the University. A letter from Mary Kirkus, University Librarian from 1941 to 1959, to President Morito suggests she may have made the decision alone. The University of Reading was inscribed on the donations in acknowledgment of ‘the contribution’ and ‘good will’, and remain in the Peace Library today. 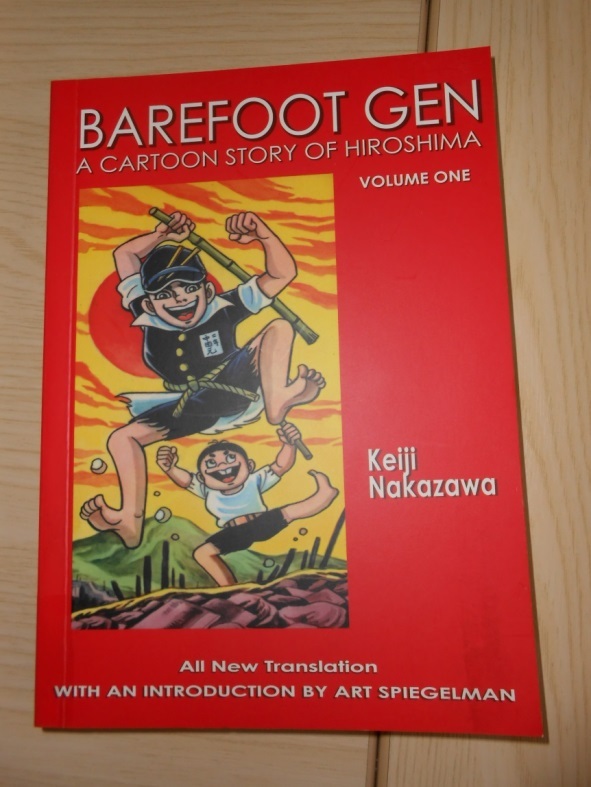 The University of Hiroshima also donated ten volumes of early Japanese manga books – Barefoot Gen by Keiji Nakazawa, first published in Japanese in 1974. Barefoot Gen was originally published in a series of magazines until circa 1985. Elements of the work are autobiographical and reflect Nakazawa’s 6 year old self and the experiences of his family. A complete set of books were donated after the translation of the last book into English in 2001. The comic strip format of the books is made more poignant by the fact that this is a child’s view of the bomb and a description of impact on his family. The books and their ‘comic strip’ format were not without controversy in Japan where several Education Areas chose to have them removed from school libraries because of their graphic nature. The introduction to the first edition of the English translation was by author of Maus, Art Spiegelman. The tiles and manga books are now a unique and emotional part of the University’s Special Collections. Together with related documents, included those sent by the University of Hiroshima to accompany the donations confirming that the tiles are safe, are on display in the Special Collections staircase hall until 8th September 2015. Ramona Salzgeber from the Centre of Eastern German Studies is working with us at Special Collections as an intern. For research purposes she is working to digitise propaganda films from WW2 and films from the DDR from the CEGS archival collection which will later be transferred to Special Collections for storage. Working with old film material can be very interesting. Most of the films that are dealt with at the Centre of Eastern German Studies are propaganda films and films from the DDR time. The propaganda films show mostly the “happy and fun” time from WW2 and would not make you think of war time or pre-war time. Additionally, films from the DDR can be under censorship which did not allow any references to the war at all. 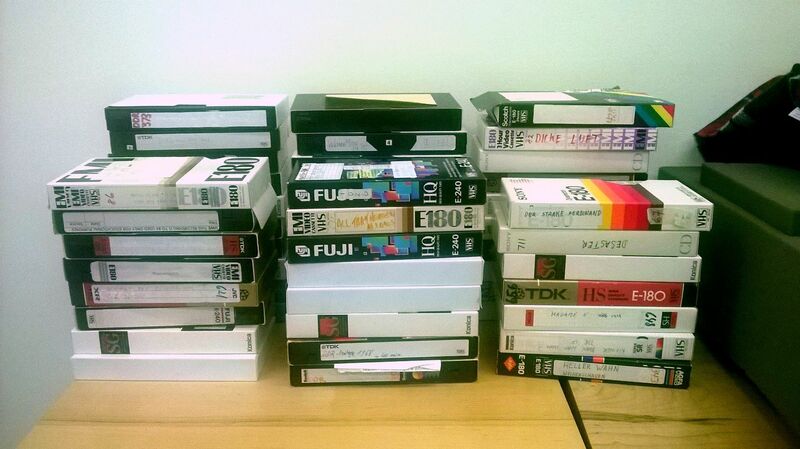 As the films are on old video cassettes, they have to be digitized in order to save the. Most of those films in the Archive were recorded in the 80s and 90s when people still had to process a lot from the past century. What a lot of people may have forgotten about those old video tapes, is that every time you play the cassette it gets slightly broken. Therefore, a cassette cannot be played forever. That’s when my part in the Archive starts. I copy the films in real time, which means I also watch every film I archive. If you are interested in history this is definitely a dream job! Many of those cassettes are not working properly anymore and digitizing them can be quite difficult. The sound can change sometimes and pictures start to flare occasionally. It is important though to keep going as this might be the last chance to save all this old film material. This is part of history and it should be available for later researching purposes. It is to say that there are also many documentaries which might be depressing sometimes, as they are from WW2 times. But this is why we work with history, to learn from it and hopefully to prevent it from happening again! Please contact us at specialcollections@reading.ac.uk for more information. When turning the pages of The Song of Songs, one of our recent acquisitions for the Printing Collection, for the first time, you could be forgiven for thinking it is a medieval illuminated manuscript, with a handwritten script and elaborate handpainted illumination. 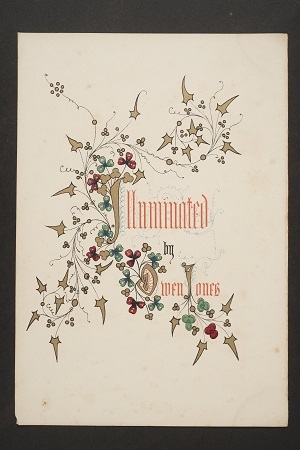 However, it is actually a printed book, published in 1849 by Longman, and written and ‘illuminated’ by the influential artist, designer and architect Owen Jones (1809–1874). The Song of Songs, also known as the Song of Solomon or Canticles, is the fifth of the “wisdom” books in the Old Testament of the Bible. This romantic song or poem is a celebration of sexual love which has been interpreted in numerous ways. In the Christian tradition, for example, in addition to recognising the literal meaning of a romantic song between man and woman, the poem has also been read as an allegory of Christ (the bridegroom) and his Church (the bride). Religious works such as The Song of Songs appealed to the Victorian taste for morality and piety, and Owen Jones produced a number of other ‘illuminated’ gift book editions of religious texts, including the Sermon on the Mount (1844, 1845), The Psalms of David (1861) and The History of Joseph and His Brethren : Genesis Chapters XXXVII. XXXVIII, XL (1862), and we have copies of all of these books in the rare book collections. 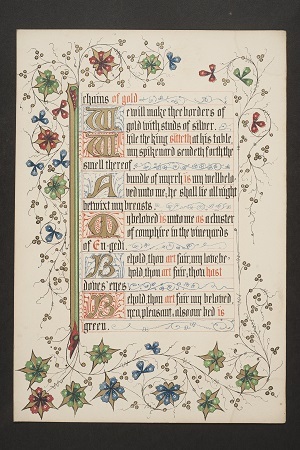 All of these works, including The Song of Songs, were printed using the technique of chromolithography, a new and elaborate method of colour printing. 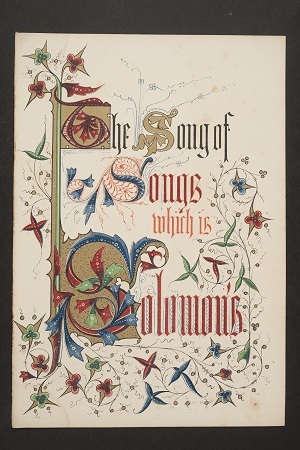 Verso of title-page from ‘The Song of Songs’, which reads ‘Illuminated by Owen Jones’. Owen Jones is perhaps most well-known for his influential publication, The Grammar of Ornament (1856), a lavish compendium of nineteen styles of historic and world ornament, concluding with a final chapter on nature. The book contains one hundred magnificent and highly detailed chromolithographed plates of ornaments drawn from architecture, textiles, tiles, rare books, metalwork, stained glass and many other decorative arts, and was the subject of one of our Featured Items. Jones’s publication Plans, elevations, sections and details of the Alhambra, which appeared in several parts between the years 1842 to 1845, was to be the first significant published work to be printed using chromolithography, and a copy of this two-volume work is held in our Overstone Library collection. 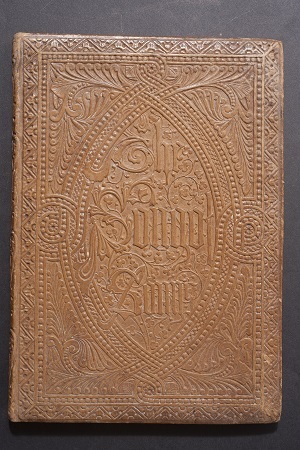 The Song of Songs is also interesting for its original brown ‘relievo’ binding [see image below], a Victorian invention of moulded and embossed leather which was intended to imitate both medieval books and wood carvings. The Psalms of David, another of the ‘illuminated’ religious publications by Jones in our collections, has a similar binding (by Leighton, Son & Hodge). This new acquisition not only complements the other publications by Jones which we hold in our collections, but also examples of original artwork by Jones for diaries, calendars and Huntley and Palmers biscuit packaging, held in the University’s archive collections. This post also presents a good opportunity to pay special tribute to the work of Geoff Gardner and Jane Li from the University Library, who do a great deal of our rare book conservation work. Geoff and Jane produce many intricate book repairs and make special boxes for our rare books which enable many of our treasures to be handled and studied by students and other researchers, and to be in a suitable condition to exhibit as part of displays here at Special Collections and to be loaned to other institutions for external exhibitions. 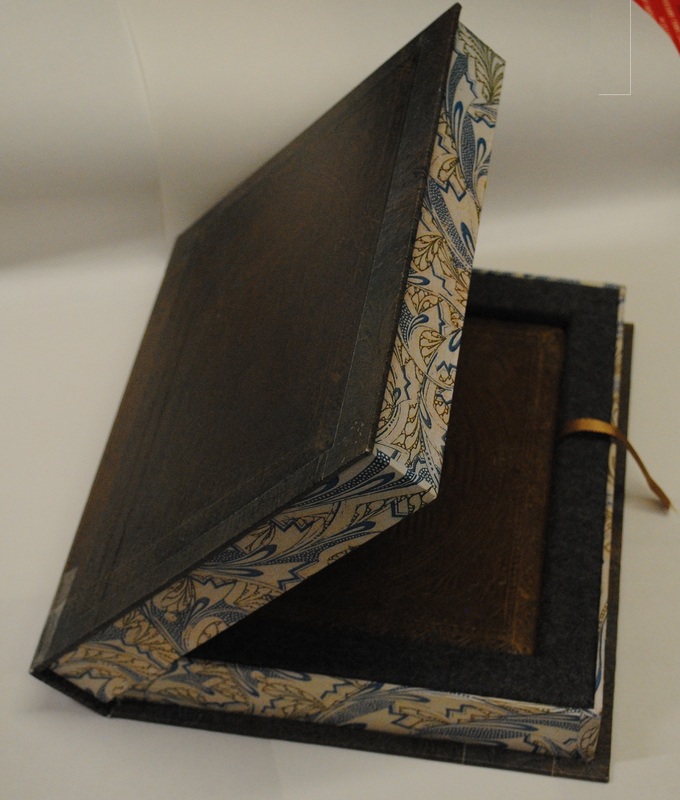 For example, in order to protect the relievo binding of The Song of Songs, Jane produced this exquisite, padded conservation-standard box [see image above] in which to store the book, reproducing designs from the book to create a suitably elegant and decorative design. We are very lucky to be able to undertake conservation work and repairs in-house and are very grateful to Geoff and Jane for their hard work!